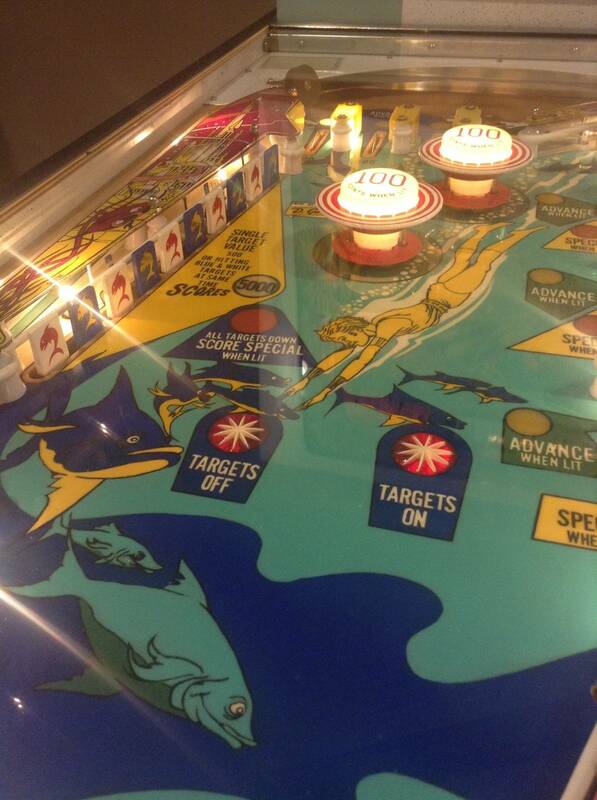 » Forum » Electro-Mechanical » EM Pinball Hangout » Atlantis - Back from the brink! » Atlantis - Back from the brink! Atlantis - Back from the brink! 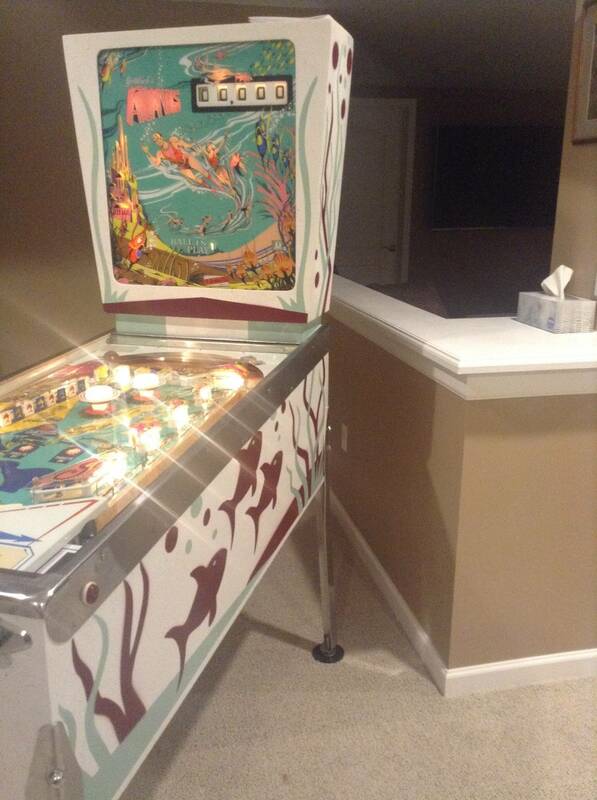 Just finished a full restore of my once termite ridden Atlantis! Very nice!! Is that a Wade PF? 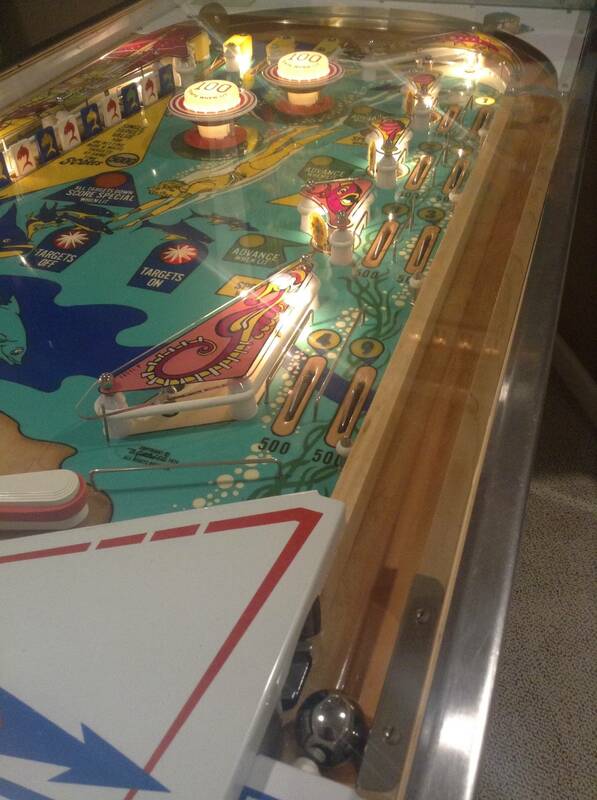 I ask because you have the pin above the right flipper, which my Wade PF doesn't have. Nice, looks like you're also set up for 3 more Wade Krause playfields. Looks Great! Excellent work. 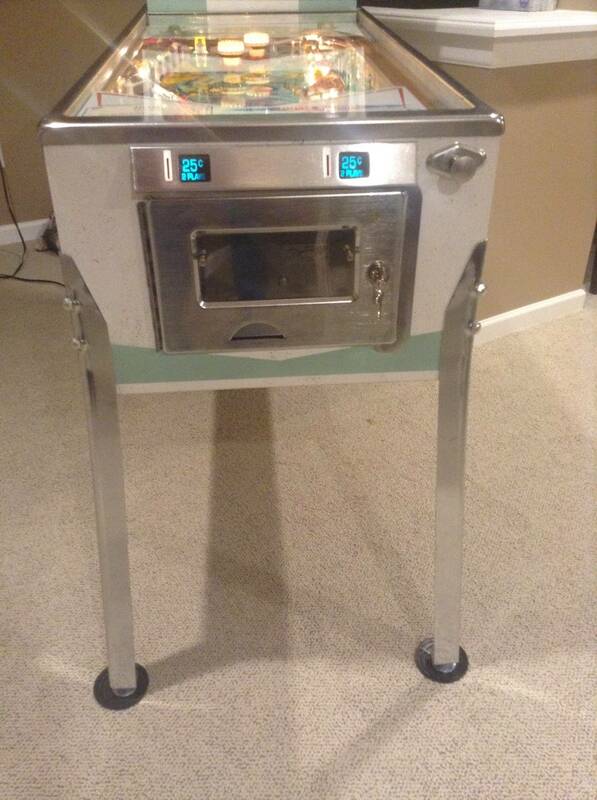 How was the playfield when you started? I guess I'm being dense, what do you mean by that? 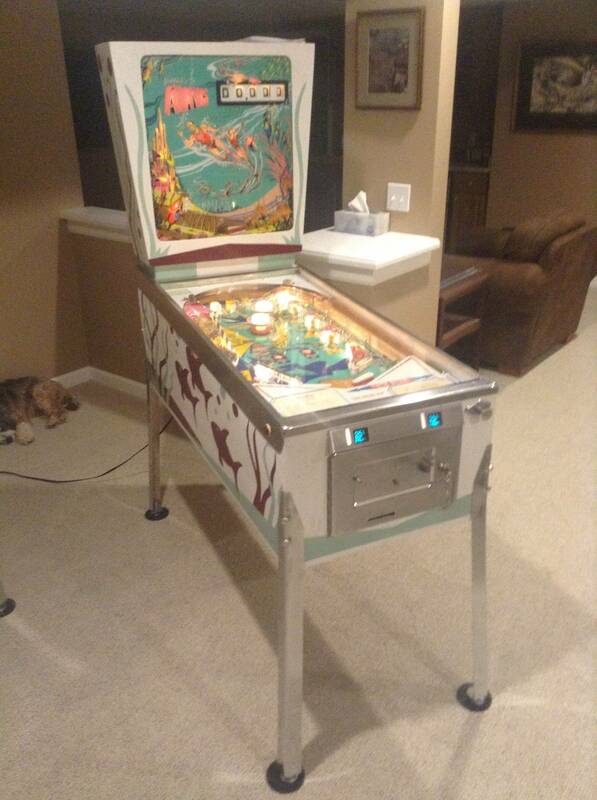 The playfield wasn't as bad as some, but was definitely dirty and would not clean up too well, so I did a complete repaint. Nice resto for an EM classic. Because those are on his list. He is gonna do Jumping Jack, Quick Draw and Sky Jump. Sky Jump will finish soon, I hope. Is that hard / expensive to do? Looks Great! Certainly not expensive, the way I do it, but very tedious and time consuming. I guess you just have to like doing stuff like that. I repaint with Joanne fabrics acrylic paints and craft brushes. Then I clearcoat with, dare I say, brush on minwax polycrylic. Block sanding between coats 2 or 3 through 7. Many say that is sacrilege, but in my experience it looks good if done right, and with the amount of play the machines get in home use, holds up very well. BTW, the backglass is a Bgresto. Shout out to Steve, who has done all of my backglasses and does a magnificent job, in my opinion. Very, very nice like all of your pins! That cab is perfect... repainted or original? The cabinet is repainted using rattle cans and homemade stencils. Actually the original cabinet was toast due to heavy termite damage, so I had to sacrifice another machine and use its cabinet. 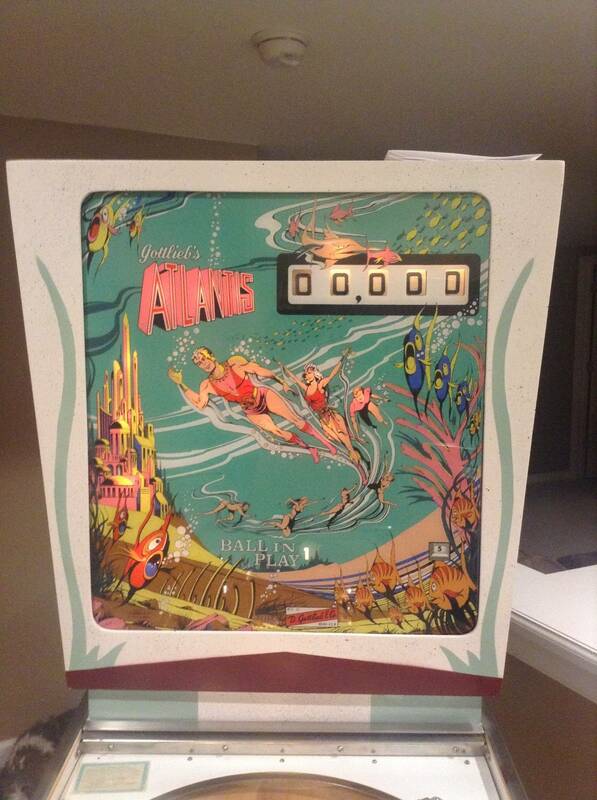 Cool that a two player king cool has the exact same cabinet as the Atlantis. Fantastic work. It looks great! Thanks. I had not played too many games on Atlantis before I bought it, but man is it a great playing game! Very entertaining rule set for sure. I think it just turned into my favorite game! Atlantis is a fun game and I have restored two. Problem is once I get them nice someone ends up buying mine. Hats off to you, very nice work. I'm still undecided about whether to restore my cabinet... or keep the 70's patina... this thread definitely has me leaning towards a restore now. he did not have the sample glass on file but he did make the sample glass for me and it is perfect. I got an Atlantis sample glass from Steve, looks amazing! Not sacrilege if the results improve on the condition. I use similar methods that look and play well. Try using Varathane semigloss in a spray can instead of the Minwax. You may find it is superior. Also available in a 1/2 pint can that can be used to fill/level inserts. There is an interesting article on Ciffy's website about a game did that is worth reading about pink color shift to orange. I use light coats (4-5 total) that allow for leveling and correcting problems along the way as one sands. Keep up the good work! Project looks great. Not sacrilege if these are the results. I think you are an artist. I ended up using a donor cabinet and a donor back box head. I rebuilt an entirely new back box light box board and a new bottom cabinet board and piece of wood for tilt mech. 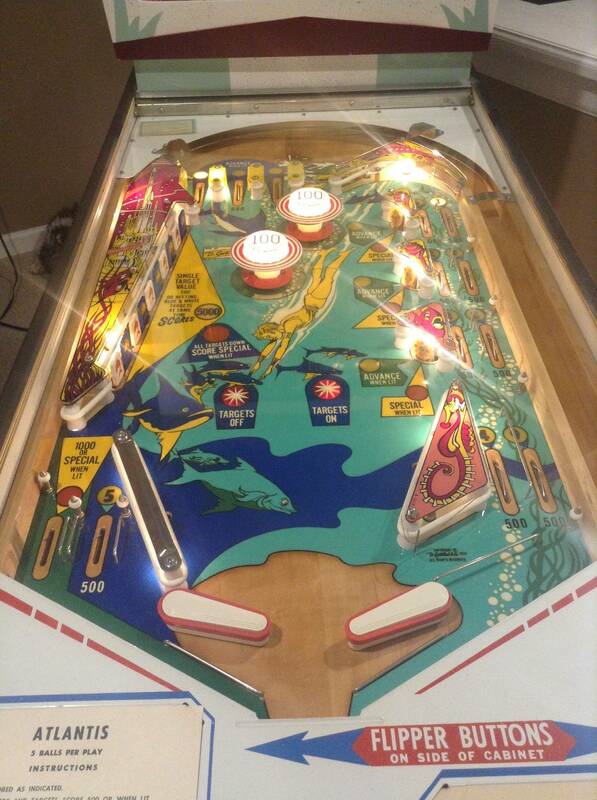 Threw every piece of wood out except for the playfield which was in reasonable shape. I inspected and treated with some sort of termite stuff, can't remember the name. The whole termite experience was a nightmare. I will NEVER do that again. Perhaps in another thread I will tell that story. In retrospect, the machine looks good now, but I still get nervous about having brought the original machine anywhere near my house. 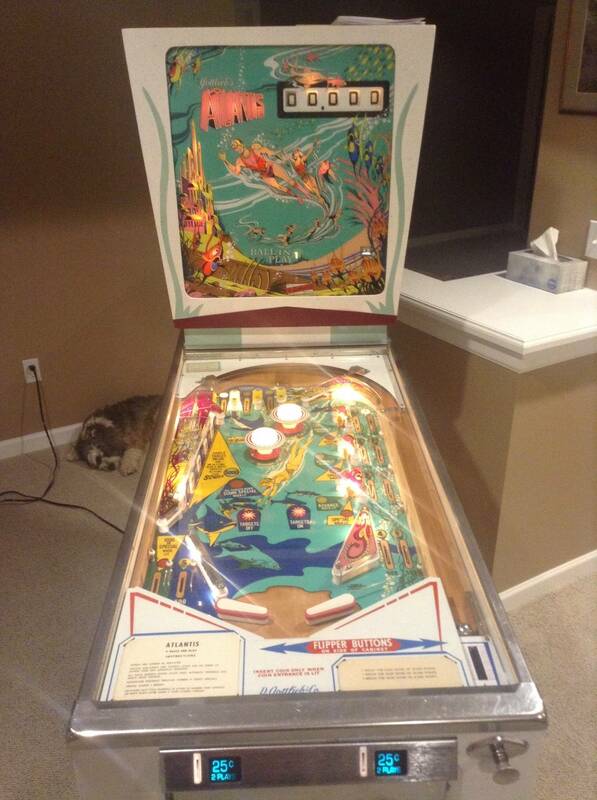 I also paid WAY too much for the machine in its awful condition, but after all it is an Atlantis. Atlantis is such a great game. Oh I saw your thread. Beautiful job! I referred to it on a couple of occasions. Thanks for sharing your great work! Minor point - flippers are not meant to be set up offset on this game. Yeah, I was so excited to take some pics, I did so before I finished adjusting the flipper position. Think I have it right now though, thanks for the input. You guys don't miss a thing! I wasn't sure about that. The game had the pin when I got it. The ipdb write up does not indicate that the pin was only on the sample games, so I wasn't sure what to do with it. no big deal it doesn't hurt being there. i have seen 75% of atlantis with the unneeded pin. I learn something every day! I might just remove that pin now.